Inject a touch of opulence into any decor with one of our high quality Mayfair rugs. This new and beautiful collection blends modern day styling with antique and intricate designs, stunning neutral shades of gold, blue and grey compliment a luxurious off white base colour. 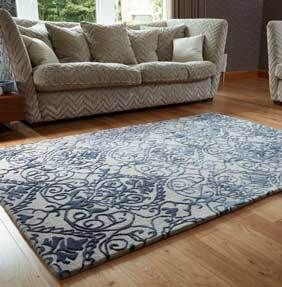 Mayfair is handmade from a blend of the finest wool and viscose, thus creating a rich and classy rug with instant appeal.